It is the second consecutive year that Communities@Work has been named National Service of the Year at the annual Family Day Care Awards. 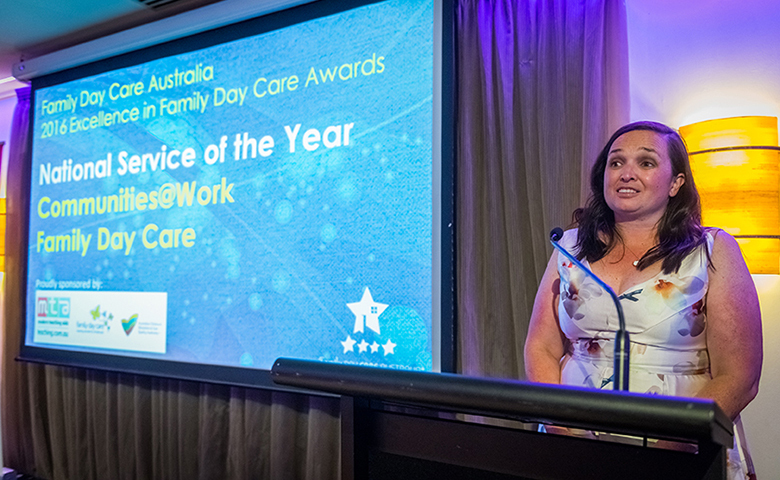 Communities@Work’s Family Day Care service has been named the national service of the year for the second year running at the annual Excellence in Family Day Care Awards held in Melbourne last weekend. Communities@Work’s educator of eight years, Yuan Zhou, was also awarded ACT Educator of the year. The awards, now in their fifth year, are hosted by the national peak body, Family Day Care Australia, and recognise the integral role family day care educators play in the lives of children, families and communities right across Australia. There are over 25,000 family day care educators who provide quality care and education to over 220,850 children every year. The FDC team were absolutely thrilled to have won again. Immediately after their win last year, the team strategised how we could continue to innovate, strengthen and support the educators in our scheme. This paid off as Communities@Work was recognised for the strong and professional relationships that educators continue to build with each other, allowing them to feel empowered to improve their own services. The collaborative relationships that the Family Day Care scheme has developed with other local organisations and community groups is another factor that led to the team earning the national title for the second consecutive year. Yuan Zhou gave the team more reason to celebrate on the night winning the ACT Educator of the Year award. She prides herself on her passion for music and language which is embedded in her curriculum. She uses music to help regulate children’s moods, from humming to help calm a child or playing soothing background music to ease children to sleep. Yuan’s practice is motivated by the philosophy to “look after children as a Mum, play with children as a playmate and educate children as a teacher” and it is this, according to Yuan, that has made the past 8 years as an educator “the happiest of her life”. Well done to the amazing FDC team on the incredible achievement. Communities@Work has Family Day Care services located across Canberra. To find out about child care options near you, visit the Communities@Work website.